Good Excuses for Custom Designs — Paper Rose Co. The start of the year for any business owner is full of exciting tasks—like bookkeeping, scheduling…taxes! Luckily with that necessary evil comes a lot of reflecting too. In December I shipped out the most orders in Paper Rose Co.'s history, and I set up shop at four events in a 3-week period. It was a crazy busy, but an awesome time! Not too surprising, I also got a little (or a lot) behind schedule with sharing all of the great custom orders I worked on towards the end of the year. Time to get caught up! I'm already staring at a list of projects I can't wait to dig into this year, but I've also been getting a lot of questions about whether or not a request is worthy of a custom order. I realize I've been focusing so much around here on my Paperversary pieces—and yes, they're fun!—but they're only a part of what I do as custom design work. Custom orders don't need to be hugely extravagant pieces or something reserved only for milestone events. Custom designs are perfect for when you need my help outfitting a space, complementing a vase, or just matching a color. Since he's local to Richmond, I was able to borrow the bottles and use them in my studio to create stems that were the right height and shape. 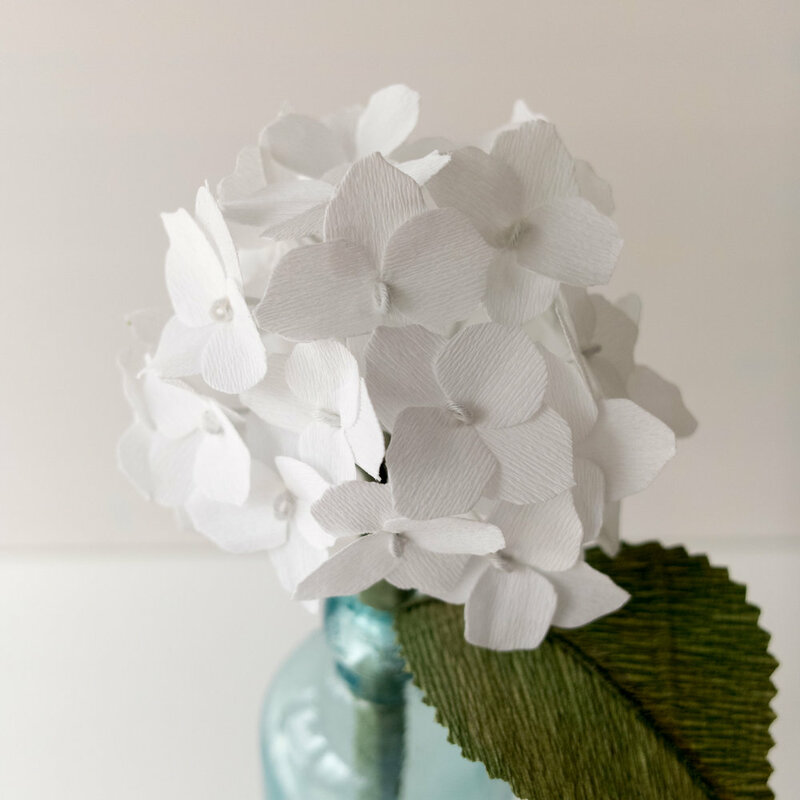 The hydrangea I usually make are quite large, so I modified my approach and made a smaller version to correctly fit the vessel. The trio works well together, or apart, and was reportedly a big hit at Christmas. Here's a fun example of a project that was done right before Christmas. Bobby had collected these vintage glass bottles and wanted me to create flowers that would go in each. He had colors in mind for two of the three, and a favorite bloom—the hydrangea—picked out for the third. Detail of shading on the rose leaves above. Another advantage of custom design work is that I budget additional time for special touches—like more intricate greenery, hand-painted accents, and extra details that I may not be able to reproduce. Custom orders are just that—custom. And more than anything, they're one-of-a-kind. 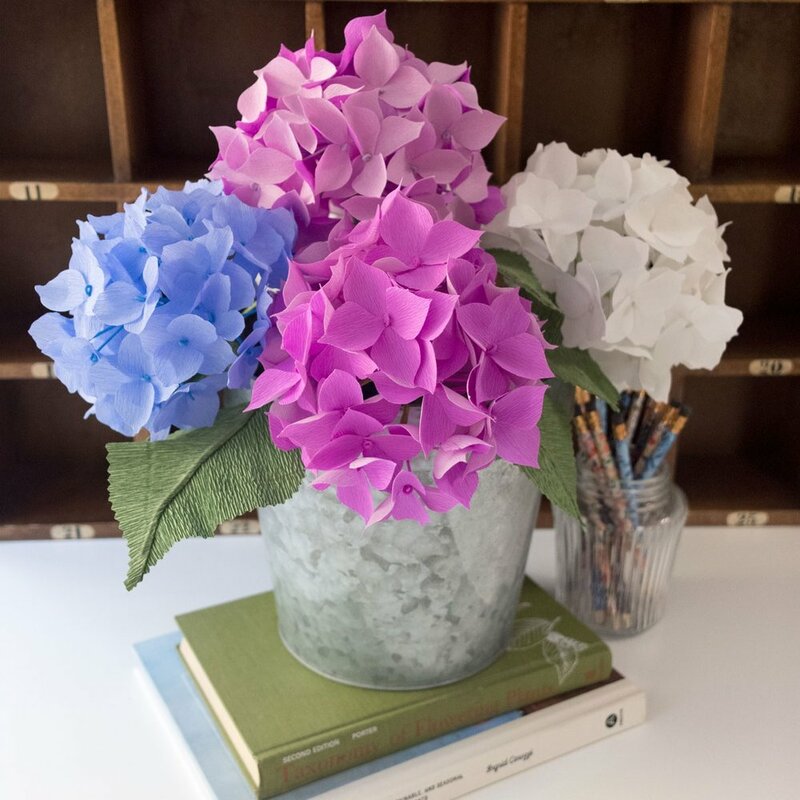 So far this year I'm working with clients to tap into childhood memories, to gift classmates a specific and meaningful bloom, to put the finishing touch on a new office, to adorn a family heirloom, and to accompany a previously purchased paper flower arrangement of mine—how fun is that! See—there are plenty of great excuses for ordering yourself a custom design. Send me a request or a question if you have an idea you want to chat about! I've got lots more projects to share and get caught up on, so stay tuned for more in the weeks ahead!